Periodically I try out a new dish that is so delicious we ‘overdose’ on it, e.g. 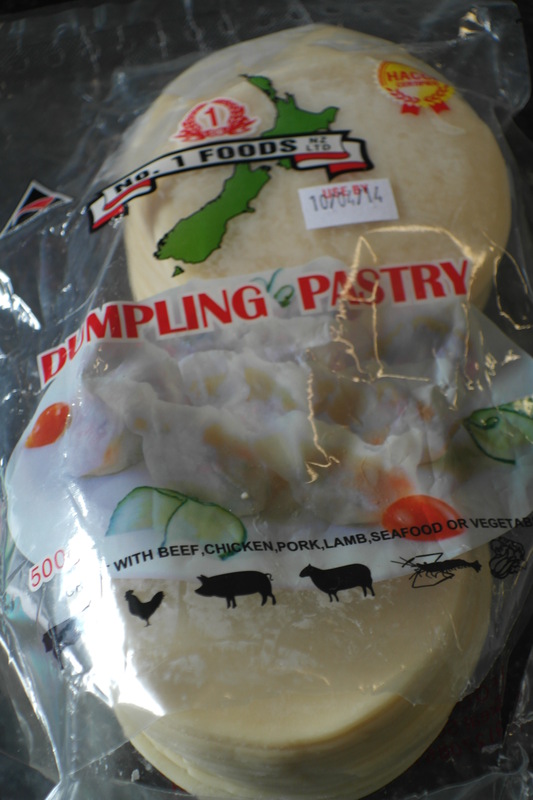 eat repeatedly in quick succession… These steamed prawn and pork dumplings is one of those meals! We eat it every few weeks since I made the recipe up. We have this dish for dinner, as an entrée when friends visited for dinner, and as a main course (I steamed some broccoli too to get our vegetable intake up!). Once our visiting friends enjoyed it so much they went home with the recipe and rumour has it they’ve had it three nights the following week for dinner. If you don’t have a Bamboo Steamer you can pick one up from any Asian grocery store (for about $5), I’d be lost without mine, but you can use any old steamer, it’s OK! 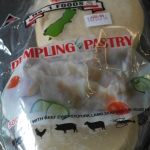 The dumpling pastry wrappers keep for a long time in the freezer, mine had been in there for quite some time and they were perfect! Get creative with the dipping sauces – we really enjoy ours with Kecap Manis (Indonesian Soy Sauce, which is very sweet), hoison sauce (with 1/4 tsp of water to ‘loosen it up’ slightly). It’s also great with the Asian staple: Sweet Chilli Sauce. 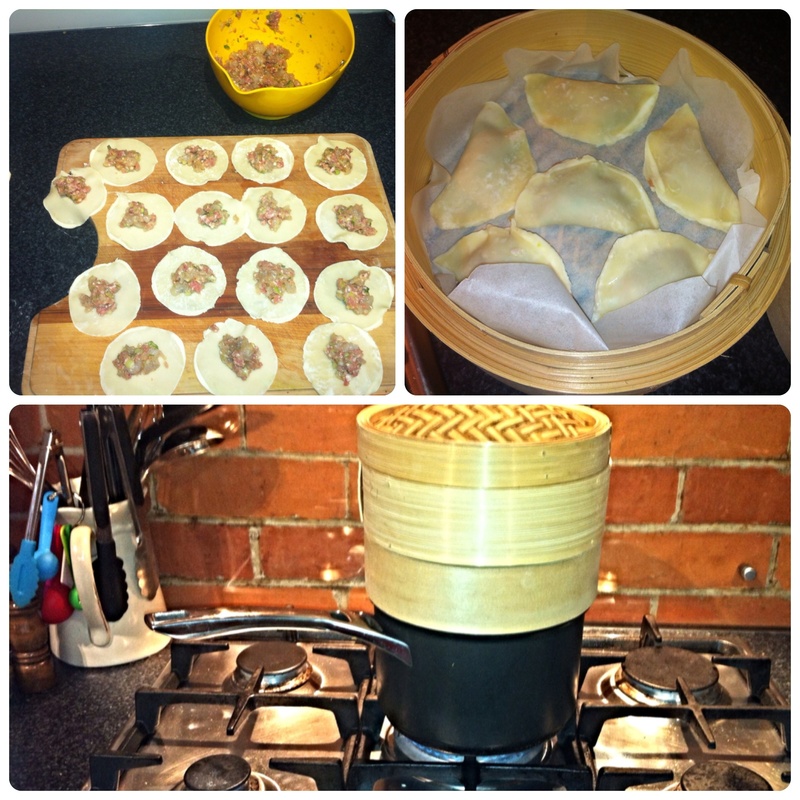 On your kitchen surface lay out the dumpling rounds. Place two level(ish) teaspoons of the filling mixture into the centre of one of the dumpling wrappers. Dip your fingers in water and run the water around the edge of the dumplings, this is so the dumpling edges get a little sticky to help with sealing them. 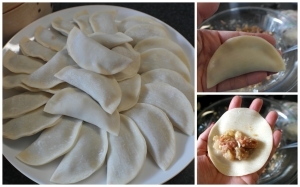 Fold the dumpling rounds in half and press to seal (so they are a half moon shape). 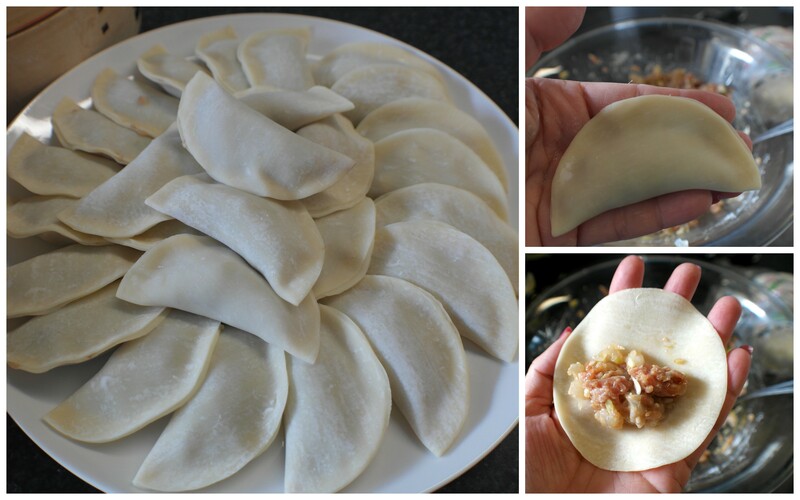 Repeat with the remaining dumpling pastry rounds until the filling is used up. 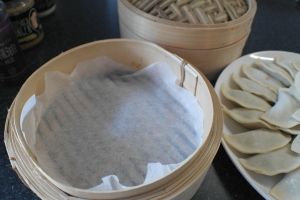 Place the dumplings in the steamer, cover with a lid and place over a pan of boiling water (making sure the water does not touch the base of the steamer). In the essence of time, steam the dumplings in two layers! 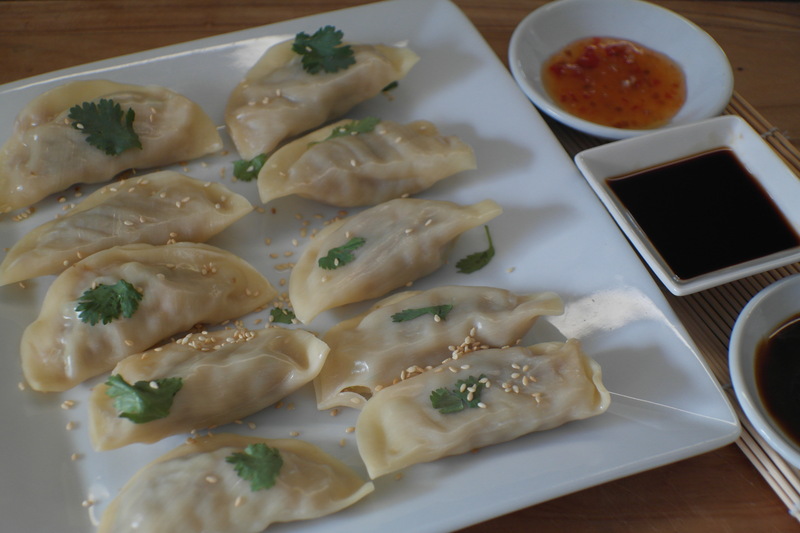 Steam the dumplings for 7 minutes, or until cooked through (be careful not to over cook, they will go tough!). You’ll need to do this in 2-3 batches (good luck not eating what you’ve just cooked as you steam the next batch). Combine the chilli and soy sauce in a bowl and serve with the dumplings.